There’s a shallow sandbar in the North Sound just off Grand Cayman. Not that big a sand bar it must be said, but what it lacks in size, it more than makes up for in reputation, for this is the legendary place they call Stingray City. And it is where you go swimming with Stingrays in Grand Cayman A place so overflowing with wonderment you would be forgiven for thinking you’ve somehow fallen into a trance like state and you’re dreaming about being massaged by stingray therapists. But this is no dream, it is however something quite extraordinary. And it does involve stingrays and massage. 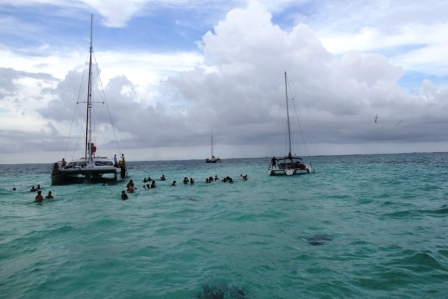 Stingray City is a natural phenomenon, a place where wild southern stingrays have gathered for decades drawn there initially by the copious fish guts and squid left behind by local fishermen who used the shallow sand bar to clean their daily catches. Word quickly spread throughout the stingray community that a fish buffet was readily available here in the North Sound whenever boats were around and the legend was born. Make no mistake though, these are wild stingrays who over time have learned to trust the hand that feeds them, enabling us to enjoy a unique experience through directly interacting with them. 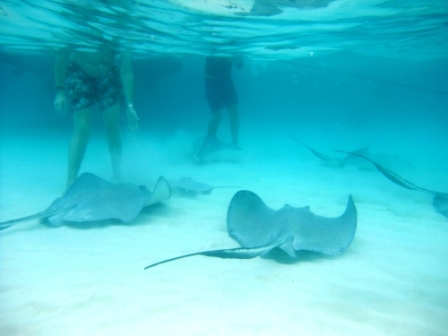 After some handling tips from Frederick, a local Caymanian who has spent a lifetime with these rays, so much so he recognises many of the regulars, I slip off the boat into the shallow waters of the Caribbean to meet my dinner companions. The water’s warm and just waist high, and looking down I see stingrays serenely gliding around my legs and feet. Crouching down, I stretch out my arms in a pleading saint like pose, perhaps hoping an added layer of spirituality might help me bond with these graceful creatures. Perhaps it is this saintly pose or perhaps more likely, the piece of squid I am holding, either way, I have caught the attention of a huge ray who pops herself into my waiting arms and just lays there on my chest gazing into my eyes. 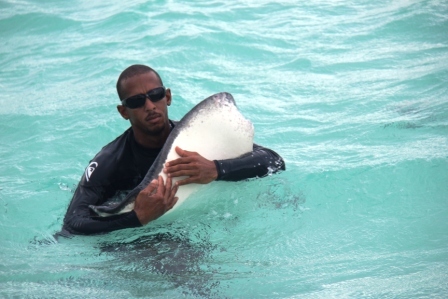 Her wings gently beating a stingray massage against my chest. This remarkable stranger from the seabed, her flesh smooth, like a giant mushroom , is clearly flirting; teasing me just enough to elicit the piece of squid from my palm, sucking the morsel from my hand and almost taking my entire thumb with it. And then she is gone; off to find another willing suitor of which there are many from the numerous tourist boats gathered around me. Yes there are scientific questions to be asked I suppose about whether this kind of human interaction is really a good or bad thing for the natural stingray community. 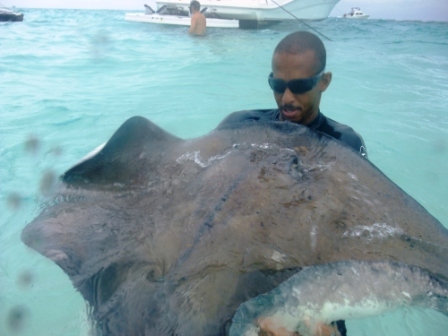 There are however, strict rules on feeding, limiting you to one small bag per boat and the stingrays are examined regularly by experts to maintain their well being. Personally, I found the whole experience jaw dropping. My very own Attenborough moment which will live forever in my heart. 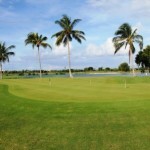 British Airways operates a service from Heathrow to Grand Cayman four times a week. The lead-in fare is from £779.75 including taxes/fees/carrier charges. 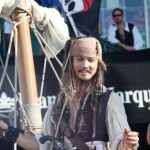 To book or for more information visit www.ba.com or call 0844 4930787. Featured image (c) Andy Hollis.